Safeway Inc. is one of the largest supermarket chains in North America. The company is based in Pleasanton, California. 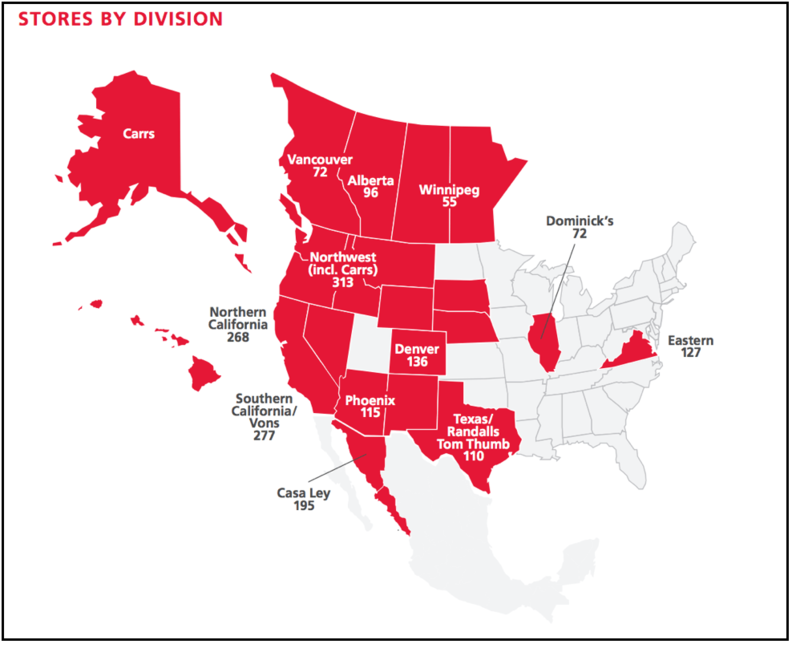 As of January 2014, Safeway operates more than 1,330 stores under several different chains in the US, such as: Carss-Safeway, Pavillions, Randalls, Safeway, Tom Thumb, and Vons. Safeway Inc. also operates 190 stores in Mexico in partnership with Casa Ley – Safeway holds a 49% interest in Casa Ley, S.A. de C.V.
Acquisition deal agreed: Since February 21, 2014, Safeway has been in advanced negotiations with Cerberus Capital Management regarding an acquisition. On March 6, 2014, Cerberus, which owns rival grocery chain Albertsons, announced an acquisition deal worth $9.4 billion which is expected to be completed in Q4 2014 (i.e. Safeway to be acquired). Safeway was founded by Sam Seelig, a man who opened a chain of grocery stores in Los Angeles in the late 1910’s under the Sam Seelig Company. It wasn’t until 1925 that Seelig changed the name of the company to Safeway. In 1927 Safeway went public on the New York Stock Exchange – at a stock price of $226. In the 1930s Safeway introduced produce pricing by the pound and “sell by” dates on perishables to ensure freshness. The company was taken private in 1986 after being acquired by Kohlberg Kravis Roberts (KKR). However four years later, in 1990, Safeway was taken public again – issuing 46 million shares at $2.81 per share. According to Safeway, approximately 82% of its stores are 35,000 square feet or larger.